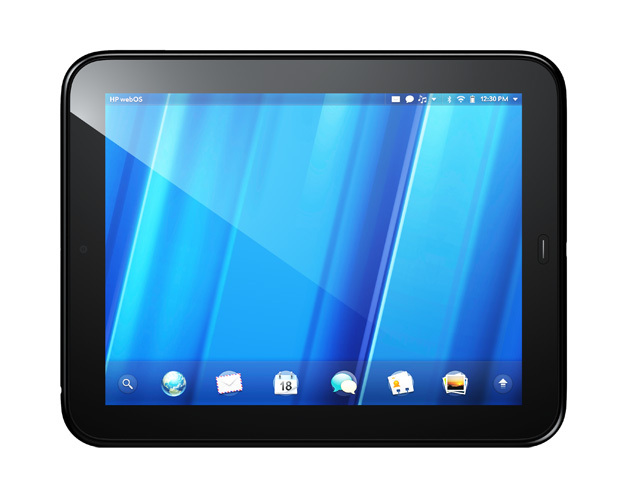 Overnight in the US, HP unveiled its answer to Apple’s iPad; a new tablet based on the webOS operating system it acquired with Palm. But it remains unclear whether the device will launch in Australia — with its webOS predecessors never having made it down under, and no details on local availability having been confirmed as yet. In its press conference, HP made no specific mention of international availability of the device, noting that it would be available “this summer” in the US — which means Australia’s winter, or in the middle of this year. A HP spokesperson contacted this morning has not yet responded to a request for comment on the issue. The device itself appears physically similar to the iPad, with a 9.7″ display, a screen resolution of 1024×768, a dual-core Qualcomm Snapdragon CPI, and inbuilt camera and Wi-Fi access — with what HP is billing as 3G and “4G” versions down the track. And it runs webOS — the Linux-based operating system which HP acquired with its Palm buy in early 2010. Despite a degree of popularity in the US, Palm never launched its next-generation smartphone, the Pre, in Australia. Likewise, HP has not confirmed whether two next-generation models also unveiled overnight — the Pre 3 and Veer handsets — will come to Australia. Although the Pre never launched Down Under, however, there is a small community of users already in existence in Australia who have imported devices from overseas, attracted by the Palm operating system’s Linux groundings and hackable nature. One such enthusiast — Australian open source developer Jeff Waugh — said he could understand the fact that no concrete international plans for the TouchPad were announced during HP’s press conference today, but pointed out that HP had mentioned word “global” during the event. However, he said, he would definitely import the TouchPad if it wasn’t made available in Australia “soon”. “They’re really coming through on the promise of a combined HP and Palm,” he said. Waugh has been involved in a slew of open source projects — ranging from the Ubuntu Linux distribution to the GNOME user interface and more. The developer said you could easily put an off-the-shelf webOS device into developer mode, with full root access, with a special entry code leaked online. This had driven what Waugh described as a “GREAT homebrew community” led by an Australian developer. “It’s not 100 percent open source, but it’s built on open source components, they’ve engaged with the community well, very open approach,” he said. Waugh’s main worry with the TouchPad was that it could be heavier than the iPad, which comes in at 730g for the 3G model. However, the TouchPad will weigh virtually the same thing. Some are speculating that the next iteration of the iPad could be lighter. But Waugh was philosophical about the idea. “No mobile OS is as good as webOS tho!” he said. The coolest thing is the Touch To Share concept they’ve implemented. I really like the idea. I imagine it could become quite popular. The idea is if you’re reading a page on your phone you “touch” it to your tablet, and get the link opened on a bigger screen. Isn’t this what Instapaper does? Close, can be used for this purpose, however Instrapaper is more an “online bookmarker” than it this. I think it would be better to share the information via say NFC. Because you can do other cool stuff if you do it correctly, like, session transfer. Say if you’re in the middle of making an order on Amazon, wouldn’t it be cool if you could touch your phone to PC and see the cart that you have prepared still be active, and not have to go and find all products you added to the cart? Sounds like you want to put the entire browser in the cloud! Not quite, that would be complete overkill. The idea would be to be able to transfer session information, etc, from device to device, using technology local, likely NFC, so that you can change device you are using on the fly. Centralising the infrastructure by putting it in the cloud would not work well considering you would have to pay a subscription for such a service (as I can’t think of any other way to fund the server time required), however, if we make it a system that works with NFC then we don’t need to hire service time do we? Ok, maybe not the entire browser, but the session state, cookies, bookmarks (although Chrome already does that), I would also assume settings, etc. Maybe you could be selective about which tabs appear on which devices, but personally I’d feel better having the whole thing mirrored across all of my devices. I kinda like this idea. I feel there are some security implications I’m missing – probably not everything I browse at home I’d like kept “active” when I arrived at work.. but the benefit of the solution appeals to me. I wouldn’t want to see it limited to NFC (but certainly allow transfers through NFC – and bluetooth and Wireless LAN), as being able to do it over distance would be great – especially I can connect securely in an internet cafe.. Certainly there are people who care. I want to see this brought to Australia, and I have seen quite a bit of interest in it from others as well. I hope they do- I think WebOS has the best chance of competing with Apple’s polish in the short to medium term (say 6 months to 2 years). WebOS has some quite cool attributes. Honestly I don’t think webOS will really be a competitor to iOS … frankly there is really only room for a couple of major players here — Android being the other one. I’m not saying they will be a major competitor to iOS, I’m saying they are the most likely to compete with the level of polish Apple has. webOS definitely is and will be a competitor to iOS. HP has the grunt and scale to keep Apple on their toes, and they’re not just looking at the mobile/tablet space. Looks like it won’t be a competitor in Australia, at least. With what looks to be at least an 18 month lead in tablets, and a three and a half-year lead in smartphones, Apple’s only real competition in Australia is going to be Android. Maybe. But at this point they’re not competing with iOS, they are competing with the App Store. It’s very important. The strength of the iOS devices lies in the App Store – if HP can’t bring a lot of high quality developers on board early, it won’t matter whether WebOS is coming to Oz. iOS, Android, Windows Phone 7, Nokia (Symbian), BlackBerry. Is there really room for webOS as well? I don’t really think so. iOs & Android are doing OK, Nokia is going backwards & knows it (they’ll be gone as a unique OS platform this week), Blackberry is going backwards but doesn’t know it yet. WP7 hasn’t caught on & unless Microsoft pulls out some much better corporate integration they are not going to. Note that I never said “leaked online”: The DEVMODE call code and the Konami code methods are listed on the Palm developer website without having to join the developer programme. HP, Palm and the community are very proud of the fact that you don’t have to “root” your phone to gain access to the guts and hack on it. I don’t think there is any doubt they will look to flog this internationally. They only bought Palm for the OS and they only wanted the OS so they could bust a move on the tablet market. I would expect that we will have to wait until everyone else is bored with it before it is released here, but it would be craziness of HP not to look downunder. Incidentally, what does everyone else think about the flood of nonbranded Android tablets that we are told to expect from Asia this year? They obviously won’t be polished, but would they do enough to be worth buying? I have read that they will cost peanuts in comparison to the big name brands. As for the Asian tablets … if you mean the Huawei and ZTE stuff, I haven’t seen anything actually good yet — I’m hanging out for branded HTC and Samsung goodness. You just know that HTC is going to do an awesome tablet shortly. Jon, I would wait and see exactly how unpolished the noname branded tablets are before I would consider them. I recall a tablet or too last year that was underpowered and with antiquated technology that was quickly superceeded (not to mention any T-Names). If someone releases a tablet that can easily run the latest version of Android and has a decent touchscreen and a decent CPU then it will be worth considering regardless of brand. I think if anything last year saw the rise of HTC from a company probably considered by most to be “no name” to now rank amongst the best, purely on the back of decent hardware.